Arsenic in groundwater is a major health problem worldwide. In Bangladesh, more than 20 million people drink arsenic-contaminated water. In the most severe cases, arsenic can cause cancer of the skin, liver, and bladder. A less well-known problem, but one that is also significant, is that many soils are contaminated with arsenic. Pollution from three major sources -- antiquated smelters, lumber treatment facilities and old apple orchards -- typically leaves arsenic in the top layers of soils. Children face the greatest risk from this form of contamination because they can accidentally ingest harmful doses of soil. The Environmental Protection Agency names arsenic as one of the worst soil contaminants in this country. 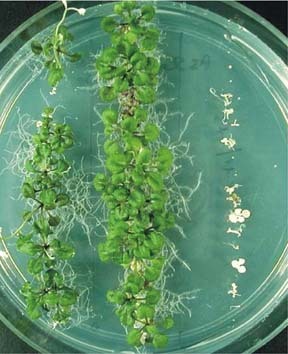 Transgenic mustard plants (two on left) grow well on arsenic-rich media, as compared to the wild variety (right). Transgenic plants may soon help clean soils contaminated with arsenic. Image provided by Om Parkash Dhankher. Unfortunately, the high cost of remediation keeps many sites from being cleaned up. Currently, the only way to mitigate arsenic in soil is to simply remove the affected soil and bury it as waste -- hazardous waste if the arsenic levels are high enough. That process costs $1 million per acre-foot, explains Rufus Chaney, a research agronomist at the U.S. Department of Agriculture. Biologists have developed a technique that may soon lower the cost of mitigation. The technique is called phytoextraction. The idea is to harness the vast root systems of plants to absorb arsenic from the soil, and to accumulate the arsenic in leaves and stems. Conventional farming equipment can harvest the arsenic-laden plants, and then take them off-site. Several generations of plants could lower arsenic to acceptable levels in many contaminated sites, Chaney explains. Already, phytoextraction is successfully taking nickel out of soil at sites in Oregon and Ontario, Chaney says. This technology, however, is still in its initial phase of development. The Oct. 7 Nature Biotechnology reports on a transgenic mustard plant that can grow well on arsenic-rich media and can accumulate two to four times more arsenic per gram of tissue than normal mustard plants. Before the lab technology can make a difference in the field, the same genes put into the mustard plant must be introduced into larger, more robust plants. Om Parkash Dhankher, a biologist at the University of Georgia and lead author of the Nature Biotechnology paper, is confident that the larger plants will be able to express the necessary genes. Chaney believes the technology will be up and running soon. "In two to five years, they should plants that can be used for commercial remediation." He expects the method will work in all but the most heavily polluted sites and will cost less than a tenth, and more likely a hundredth, of the cost of soil removal and replacement.